Fr Jimmy passed away on 24th December, 2017 after a short stay in the hospital. His funeral was held on 23rd January, 2017 and he was buried at the Wolvercote Cemetery, Oxford. May he rest in peace. At the Requiem Mass at Our Lady and St Edmund of Abingdon Church, Fr Michael McGoldrick, Provincial of the Discalced Carmelites of the Anglo-Irish Province, preached a moving homily. Many people have asked for a copy of Fr Michael's homily. Below is the full text. Many people have commented on the providential date on which Fr Jimmy died. It was indeed providential that the day on which, in the words of St John’s Gospel so loved by Fr Jimmy, “the Word became flesh and dwelt among us,” – the birthday on earth of our Saviour should also be the birthday in heaven of Fr Jimmy. 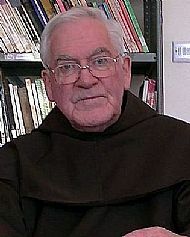 Fr James Antony – better known to us as Fr Jimmy - was born in Sligo in the west of Ireland in June 1930. He always retained a great affection for his hometown and loved to return there. He loved to spend time at the sea around Sligo. For many years swimming was one of his favourite forms of exercise – swimming all year round when he lived near the sea. He boarded at our school in Castlemartyr, Co. Cork and in September 1948 he entered the Order in Loughrea, Co. Galway He made his first profession in 1949 and was ordained in 1957. He studied Sacred Scripture in Rome and Jerusalem and obtained a doctorate on the theme of the today’s gospel: the house of many rooms in St John’s Gospel. His priestly ministry started in Dublin, teaching our theology students, and later as prior of the community. When we joined the Milltown Institute he taught there and was elected president. He taught in what was then the biggest seminary in the world in Alwaye, India. He later taught in Ushaw College before going to Australia where he became director of our retreat centre in Varroville near Sydney. He returned to Boars Hill twenty years ago and took on the editorship of Mount Carmel magazine. With the assistance of Joanne Mosley, he made it one of the leading spirituality journals. They also published several top-class books on spirituality in the Teresian Press. During his years in Boars Hill Fr Jimmy led many retreats in the priory, all over England and in many different parts of the world. He enjoyed robust health until quite recently. His death on Christmas morning was a huge shock for us all and especially for his brother, Fr Eugene. Since his death I have received nearly seventy emails from all over the world. What struck me particularly was the number of people who told me that his preaching touched their lives. A Carmelite nun in New Zealand wrote: Dear Father Jimmy was here in Christchurch not long before my Final Profession in 1987. It was after one of his wonderful talks on the Passion in scripture which so deeply touched me that it helped me make a decision that I couldn’t be anywhere else but in Carmel!! Thank you, Fr Jimmy, for the grace that came through you. A priest who is now rector of a seminary wrote: I encountered his priestly presence and his vibrant compassion (in addition to his lively sense of humour) at a time in my own life when I was unsure of what the Lord was asking of me and if it were possible for me to live out my own priesthood with fidelity and joy. It was through Jimmy (or better through Christ and his priest Jimmy) that I came to embrace my own humanity before the Lord. His words still ring in my heart and life, and I have shared them with many brother priests. Those two testimonies touch on important aspects of Fr Jimmy’s life. The first is his humanity. Jimmy once told one of the friars that he was quite rigid in his earlier life but learned that that was not the Christian way. Painful events in his life led him to embrace his own humanity, his broken humanity. That allowed the light of Christ to shine even more brightly through him. People have spoken to me about his compassion in the confessional; his constant encouragement, no matter how much a person failed, his wise spiritual guidance. There was a wonderful warmth about Fr Jimmy that made him attractive to many people and led to long-lasting friendships. He had a great spirit of hospitality, and many of us would testify to the welcome he gave us and to everyone who came to Mass or the retreats at the priory. I believe that that humanity and warmth came not just from life events but even more importantly from his growing knowledge of Jesus. Fr Jimmy did not just read and study the Scriptures, he prayed them. His bible is probably one of most thumbed bibles any of us has ever seen. It was a book dear to his heart. Before Mass it was preparing the bible to put it on his coffin. I looked for St John’s Gospel only to find most of the pages were missing. I think they fell out of the bible and into his heart! The words of scripture were always on his heart. He came to know Jesus through this prayerful reflection on Scripture. Through his prayer Jesus became more and more his friend and the inspiration of his life. His praying the Scriptures led to a particular kind of familiarity with them – a loving familiarity. It was a joy to listen to him explain the Scriptures. I cannot help seeing a parallel between him and Jesus with the disciples on the road to Emmaus: “Did not our hearts burn within us as he explained the Scriptures to us?” Our hearts burned within us as he explained the Scriptures to us. In God’s Providence Fr Jimmy was led to enter the Order of Discalced Carmelites. He loved the spirituality of the Order. He expressed his love for Carmelite spirituality in a very practical way: faithfulness to community prayer. He was exceptionally faithful to the community prayer times. He also had a custom, that inspired me a lot, of going to the chapel at night before he went to bed. He would spend quite a long time in silence before the Blessed Sacrament, probably praying in gratitude for the graces of the day. He was certainly faithful to the injunction in the Rule of St Albert, that we “ponder on the law of the Lord day and night and keep watch in our prayers”. He also loved the writings of our Carmelite saints and became an expert in many of them: Teresa of Avila, John of the Cross, Thérèse of the Child Jesus, Teresa Benedicta of the Cross – better known perhaps as Edith Stein – St Elizabeth of the Trinity, to mention just some of them. I am sure I am not alone in being inspired by the way he could quote long prayers of our saints from memory – I am thinking especially of St Thérèse’s Offering to God’s Merciful Love and St Elizabeth of the Trinity’s Prayer to the Trinity. All our saints loved the Scriptures and were familiar with them. That attracted Fr Jimmy and he read their works through the lens of the Scriptures. Those who attend Mass at Boars Hill will remember the many homilies he gave linking the Scripture readings of the day to the spirituality of the Carmelite saints. We might have thought the homilies were a bit long – but were they rich! In the prologue to his Gospel St John says, “the Word became flesh and lived among us, and we have seen his glory, the glory as of a father’s only son, full of grace and truth.” I believe that Fr Jimmy also saw something of that glory. So there was something very appropriate that he should have gone to God on the morning of the feast of the Incarnation. We pray that he now sees that glory in all its fullness. We also pray in gratitude for a long and rich life, lived in the words of our Carmelite rule, “in allegiance to Jesus Christ”. One of his particular loves was St Thérèse of the Child Jesus. Carmelites add a special devotion to their name at profession. Fr Jimmy’s full title as a Carmelite was Fr James of St Thérèse of the Child Jesus. I am sure that she has welcomed her brother into heaven with open arms. Like her, I am sure he will spend his heaven doing good on earth. May he rest in peace.